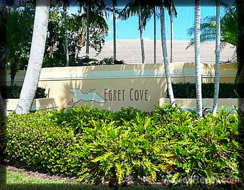 Egret Cove is a gated community of 55 homes in Maplewood in Jupiter Florida 33458 between Indiantown Road and Center/Indian Creek off Maplewood. The community features zero lot line three and four bedroom CBS (concrete block construction style) home sties with low HOA (homeowner association) fees. Egret Cove Homes for Sale also has its own community swimming pool. 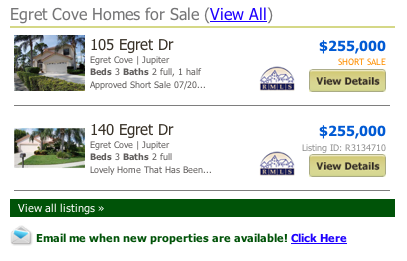 Egret Cove Homes online now. All listings & Sold Statistics! Built in the late 1990’s, this quaint neighborhood offers added security with its own gate. Residents fall in love with the small size of the community. Another feature is Maplewood is lined with sidewalks which is great for joggers, runners, bicycle riding or just taking a morning or afternoon stroll. The location of Egret Cove Homes for sale is ideal. Nearby public school Jerry Thomas is within walking distance. Jupiter Montessori and Jupiter Academy offer excellent private school options. Basketball and racquetball and tennis courts are close by neighboring Maplewood or Indiancreek Parks. The Florida Turnpike and I95 are within a 5-10 minute drive. Palm Beach International Airport keeps property values high with its great locale of daily flights. The beach is also close by. Choose between Juno Beach with its famous fishing pier, the beautiful sands of Jupiter or terrific diving and snorkeling off land or for boaters in the Intracoastal or Coral Cove and Blowing Rocks in Jupiter Island past the Jupiter Lighthouse and Jupiter Island Bridge in Tequesta. Travel down Maplewood to Indiantown Road for close shopping and great restaurants. Tabica Grill is a great affordable lunch or dinner choice and has been in Jupiter many years. Another favorite for morning fare is Jim’s Breakfast Cafe. Outback Steakhouse is also on Indiantown closer to US Highway One. Duffy’s is always a family favorite. The Palm Beach Gardens Mall lets you shop for basics at Sears and Radio Shack and also offers the upscale Saks, Neiman Marcus and Nordstoms. Posted in Jupiter homes, Uncategorized on August 14, 2011 at 1:01 pm.